There are three major benefits to buying foods according to the season: better taste, more nutrients, and cheaper prices! Here are seven of my favorite fall fruits and veggies. I like my apples like I like the weather—nice and crisp! There's such a wide range to choose from: tart Granny Smith, sweet Pink Lady, mild Golden Delicious, sweet-tart Fuji (my favorite! ), and more. Try a bunch to see which you like best. Apples are high in fiber and low in calories, so they make an awesome mid-day snack. Some experts even say they can be good for weight loss. Eat them plain, spread some peanut butter on ‘em, or get cooking! Pro tip: Granny Smith apples are great for baking. Remember when Joey from Friends made fun of Ross for calling it “squatternut bosh”? Call it whatever you want, the cool-weather squash is a must-have in my book. It has a slightly sweet flavor and it's seriously filling. It's also an excellent source of vitamin A and vitamin C, both of which are great to take in as we head into cold season. Butternut squash is fantastic steamed & mashed, cubed & cooked in a skillet, and even baked into French fries! That last one’s a life changer. Brussels sprouts have made a comeback in the past few years; they’re not the boring boiled veggies grandma used to make! 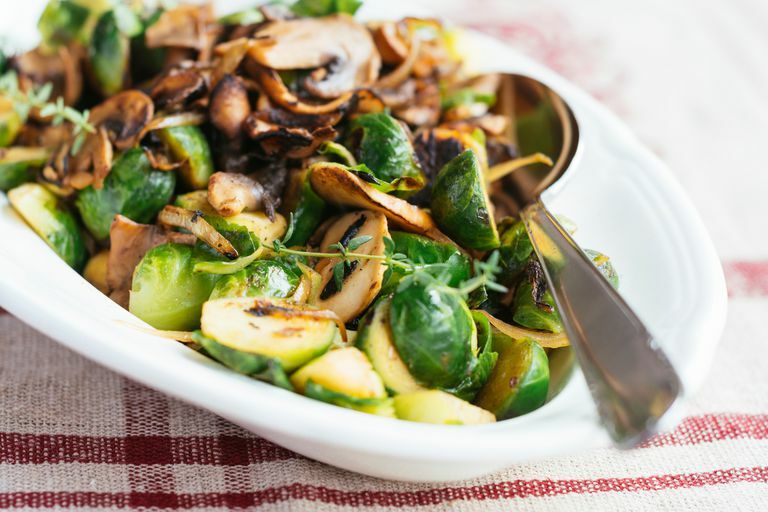 When cooked right, Brussels sprouts are tender and delicious with a slightly nutty taste. Get creative with sauces (balsamic vinegar, teriyaki marinade, marinara, etc.) and different mix-ins (like nuts, dried fruit, and crumbled bacon)! Not quite sure how to prepare them? First, slice off and discard the tough ends; then cut them in half. Next, steam them in the microwave, toss them in a slow cooker with a little liquid, or bake them in the oven at a high temp. Easy peasy! Anyone who knows me knows that I love this squash! It’s a great swap for pasta: You can save loads of calories and carbs, but you'll still feel like you're eating a bowl of spaghetti. (Yes, I know that’s slightly obvious given its name). Don’t be intimidated by its tough exterior; once cooked until soft, you can easily scrape out the noodle-like strands. Bake it in the oven, microwave it, or make it in a slow cooker. The choice is yours. Here's a fantastic guide that outlines all three techniques, plus serving suggestions! Cauliflower is the gift that keeps on giving. Once I discovered that cauliflower could be blitzed in a blender to be used as a rice substitute, I became obsessed! It's amazing in soups, "fried rice," pizza crust. I also like to mash cauliflower as a way to bulk up mashed potatoes. You can even use those mashies as a light topping for shepherd's pie. Try it! The sweet, nutty flavor of acorn squash makes it the perfect way to round out this list. And the softball-sized gourd is incredible stuffed with other foods! Just halve it, remove the seeds, and bake for a couple of tasty edible bowls. Fill it with chili, veggies in light cheese sauce. The list goes on and on. Trust me: This find can really squash a craving for comfort food! What Can You Eat on the South Beach Diet, Anyway?